Maintenance of small aquariums is kind of difficult due to its smaller amount of water. 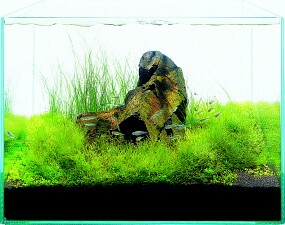 However, even a small aquarium system is sufficient for enjoying planted aquariums. If necessary the equipment is provided and adequate efforts are made for the maintenance. When installed on glass-made Cube Cabinet Clear together with the ADA AQUASKY, this mini system beautifully decorates your room as if an aquascape is floating in the air. 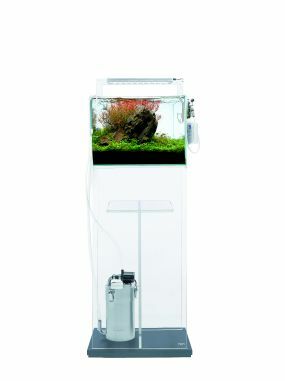 This is the small and high quality aquarium system that only ADA can provide. You can enjoy an Iwagumi layout that uses Manten Stone even in a small aquarium tank. 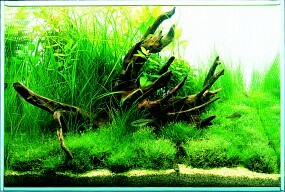 A key to making the aquascape look larger is to choose aquatic plants having narrow leaves. Mosses and ferns attached to driftwood provide relaxation to everyone who sees them. When we look into the aquarium, we can feel the breath of Mother Nature in the small space. 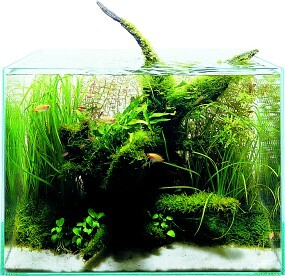 This is a planted aquarium made up only with Japanese aquatic plants. It does not have a striking charm but reproduces a scene with a stream that gives off a somewhat nostalgic feeling.